Pulaski County is one of the original five counties in Arkansas. Map created by Mike Keckhaver / Courtesy of the Encyclopedia of Arkansas History and Culture. Pulaski County is home to approximately 45,000 veterans. 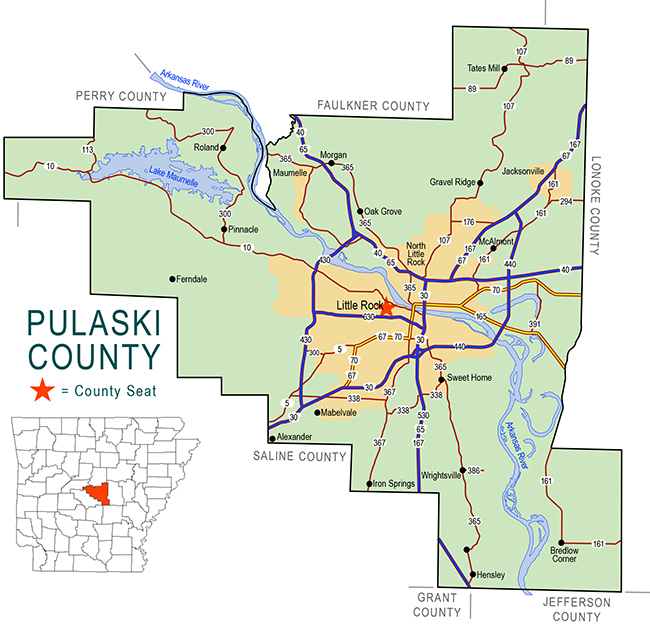 Pulaski County was created on December 15, 1818, and was one of five counties organized when Arkansas was part of the Missouri Territory. It was named for Count Casimir Pulaski, a Polish soldier credited with saving George Washington’s life during the Revolutionary War. The landscape of the county is rugged terrain western and northern and rolling hills in the southern tip with the Arkansas River Valley delta in the east. Pulaski County is the most populous county in the state. Little Rock is the county seat and the State Capitol. The economic base is largely government and support services. Metropolitan Pulaski County offers many educational and cultural opportunities such as the Arkansas Arts Center, the Museum of Science and History, the University of Arkansas at Little Rock and the Little Rock Zoo, which is now entering into a complete renovation program. Pinnacle Mountain State Park, a 1,800-acre environmental park is only 15 miles from Little Rock and offers picnicking, hiking, and canoeing on the Big and Little Maumelle Rivers. The State Capitol, built of Arkansas granite, is a scaled-down replica of the Nation’s Capitol. The Old State House, Arkansas’ Capitol from 1836 to 1911, except briefly during the Civil War, now houses a museum of Arkansas history. The new reconstruction of the county courthouse has recently been completed and is beautiful. In the large central hall of the 1912 courthouse, twelve imposing statues representing art, justice, agriculture and machinery stand on pedestals supported by sixteen marble columns that ring a two-story rotunda capped with a magnificent stained-glass dome. A large metal bust of Count Pulaski is centered beneath the rotunda on the inlaid marble floor of alternating white and gray radial bands. Every door has large brass fixtures with the seal of the Arkansas Territory engraved on the push plates and “PC” engraved on the doorknobs. This stately 1912 courthouse is visited by hundreds of local people and tourists each year. Born on March 6, 1745, at Warka on the Pilica, Poland, he was the middle of the three sons of Josef Pulaski. He came from a family of knightly traditions. The Pulaskis took part in the victorious wars by King John III Sobieski against the Turks in the 17th century. By age 21, Casimir Pulaski proved to be a true military talent, fighting in battles across the European continent. 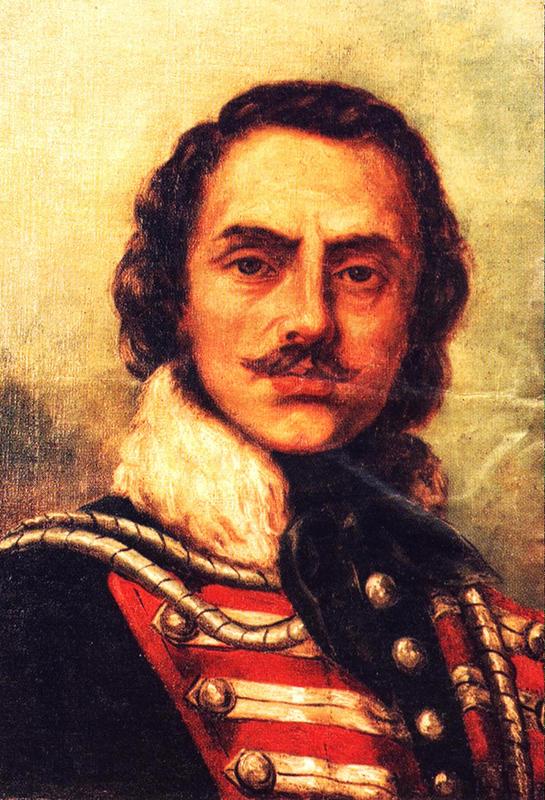 By 1776, Pulaski learned of America’s struggle for independence and offered his services to the cause. Pulaski arrived in Boston in July 1777. Pulaski would serve next to George Washington who appreciated Pulaski’s vast military experience. On September 15, 1777, the American congress promoted Pulaski to the rank of Brigadier General in command of cavalry. Pulaski quickly distinguished himself at Brandywine, where he covered the retreat of Washington’s troops, preventing a total rout. Pulaski gained more success at Germantown. In May, 1778, Pulaski began to form an independent cavalry unit that would be known as the Pulaski Legion. Comprised of Americans, German, Frenchmen, Irishmen, and Poles, the legion would see immediate action in October along the New Jersey coast. The Pulaski legion would later guard the northern border of Pennsylvania before heading south. In May 1779, the Pulaski Legion helped defend Charleston, South Carolina against the British. The following months the legion engaged in reconnaissance and guerrilla warfare in South Carolina. By the fall of 1779, the Pulaski Legion headed toward Savannah, Georgia in an effort to join other French and American troops in an attempt to retake Savannah from the British. In the attack on October 9, 1779, American and French forces fell short of retaking the city. Pulaski was also mortally wounded by grapeshot and would die two days later aboard the American ship Wasp on route to Charleston. Pulaski was then reported to have been buried at sea near the place where the Savannah River flows into the Atlantic. In 1833, the new fort being constructed on Cockspur Island outside of Savannah was christened Fort Pulaski in honor of Casimir Pulaski.